The 2015 Toyota Prius and the 2015 Mini Cooper both surprised us in our testing. Each was a lot more fun than we expected, and each also did better on fuel than their already sky-high EPA estimates. Although they are about the same size, the Prius c and the Mini Cooper Hardtop we tested had very distinct personalities. Comparably equipped, each has a price of about $24K. Let’s take a close look at each of these cars’ strengths with an eye towards their use as daily commuter vehicles. For 2014, Mini changed the Cooper Hardtop significantly. Out went the old 4-cylinder engine and in came a new 3-cylinder turbo. Having tested Ford’s Fiesta with its 3-cylinder turbo, I was prepared to be underwhelmed. Even more concerning, my tester was a 6-speed automatic. As it turned out, my worry was misplaced. This new drivetrain is fantastic. It dropped about 2.5 seconds off the car’s 0-60 MPH time, which is now 7.3 seconds. Remember, this is the base car. Also, the transmission works great. No dual-clutch goofiness. The engine is always ready and acceleration is instant. Zero turbo-lag. The engine pulls strongly at any speed, even when accelerating on the highway to pass. This base mini feels fast. The Mini Cooper Hardtop also turns on a dime and handles so competently you feel like you are going slower than you are. Look down and you are often exceeding the speed limit – by a lot. My base car’s 45-series tires on 17” optional rims gave the car a too-firm feel. Every pothole was alike a mini car accident. In fact, the first test car the fleet company brought me was a Cooper S, and it went back with a tire bubble. The Mini is danger-close to being a 3-season car due to its impractical run-flat, low-profile and expensive tires. Inside, the Mini is huge. That makes no sense, but for the two front passengers the car feels open and airy. The two A-pillars are as thick as tree-trunks and just as vertical, but eventually your brain tunes them out. I loved driving this Mini, and I looked for opportunities to blast around town in it. It was also very capable on the highway. It is a comfortable car. Mini wisely gets the dash and door away from the driver’s knees. I am 6 feet, and I felt very comfortable in this car on long highway trips. The EPA says the Mini will get about 29 MPG city, 41 highway, 34 MPG combined. In my suburban/highway loop, I got 41.5 MPG. Therefore, if you commute mostly on open-roads and highways, this is a great vehicle in terms of mileage. Mini does recommend premium fuel. I’m sorry if I am repeating myself, but the Prius c also looked boring and was not. I found it to be quick off the line and fun around town. This is clearly a city car. From 0-20 MPH, the Prius c feels almost sporty. Then it all slows down. A lot. Merging onto the highway requires planning. You cannot just zip out and match speeds with an 18-wheeler unless you want to be a hood ornament. That said, on back-roads the Prius is a nice driver, but is not at all a car you will want to look for excuses to go drive. That is true of most cars though. The Prius c has a leg up on the Mini in one important way. It is much more real-life usable on bad roads. The optional wheels are 15” alloys on this car and they provide a much more relaxed pot-hole experience. You don’t have to pull over and check for damage every 5 miles like in the Mini. In the event one does get destroyed, they will cost about a third the price of one of the Mini’s run-flats to replace. Inside, the Prius c is also roomy. Like the Mini, the knee-room works, and the car feels comfortable. Although it has 4-doors, it is really a 2+2, and barely that. Both the Mini and Prius c had ample hatch space for a normal grocery run, and both would work great as a couple’s car for a weekend, or maybe even a week-long trip with the rear seats folded down. The Prius c’s fuel economy is estimated by the EPA to be an amazing 53 MPG city, 46 highway and 50 combined. That is as good as it gets without a plug-in port in this US car market. Frankly, adding the plug does not save you any money where I live with gas under $2.50 and electricity at $0.24/kWh. This is the cheapest per-mile city commuter car there is. The Prius c uses regular unleaded fuel. In my comparisons of cars, I always talk about safety. Let’s keep it real though. The Mini has not been tested yet in the small frontal overlap test by IIHS and the Prius c rated “poor.” If safety is a priority for you in your subcompact search, good luck. You may wish to expand the search to include the larger Prius, which is a Top Safety Pick+, or a car like the Mazda3, which also gets top scores. Those are compact cars though, not subcompacts. Here we have two winners. If you commute in traffic in an urban area, the Prius c seems to be the shining star. 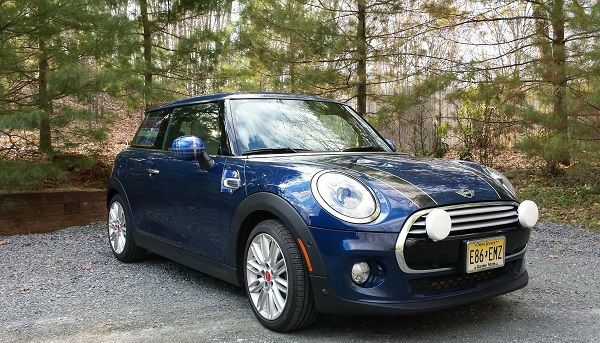 However, if you have a highway and back-roads commute, the Mini is the standout and comes with the added benefit of being a car so fun you will take it out on Sundays just for the joy of driving it. Both are happy in their habitat and relatively affordable if you can find a Mini without the full options package. For two more options we hope you will check out Patrick Rall’s recent comparison of the 2015 Honda Fit and Fiat 500 Sport. is the Copper a new model? Serious typo. If you want to be taken seriously, you should check those things first and maybe even correct them. Thanks Don. The Copper is now a Cooper. What's a Mini Copper? I'd rather have a Mini Silver. How about a Mini Tungsten? I'd go for one of those. I might go for the mini but... I wouldn't want to keep repairing it all the time whenever it breaks down, my friend had to add a replacement car to her policy just because it broke down so often. Besides, the mini is no good if you have back passenger. I just ate a Prius on the way to work today in my Cooper. Prius's sure get small fast the the Minis rear view. Poor guy.